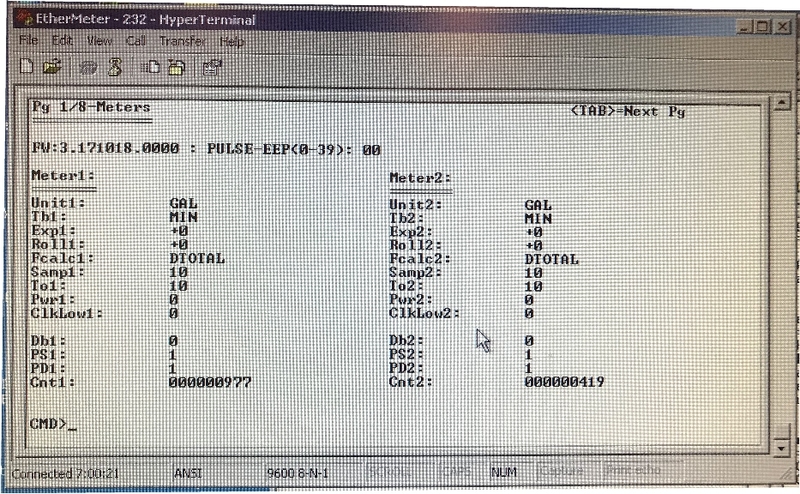 New Improved Digital Pulse De-Bounce Algorithm for EtherMeter! 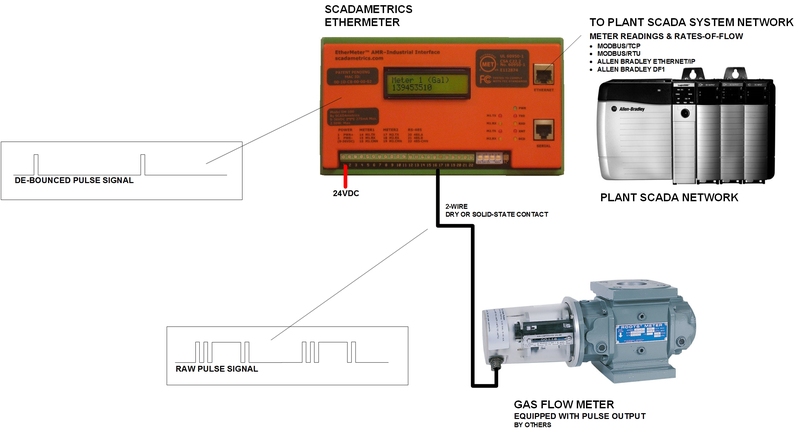 Although the EtherMeter® is designed primarily as a SCADA gateway for water meters equipped with absolute encoder signals, it also provides support for dry-contact pulse output flow meters. These can include gas meters, electric meters, water meters, wastewater meters, steam meters, hot water meters, and many others. 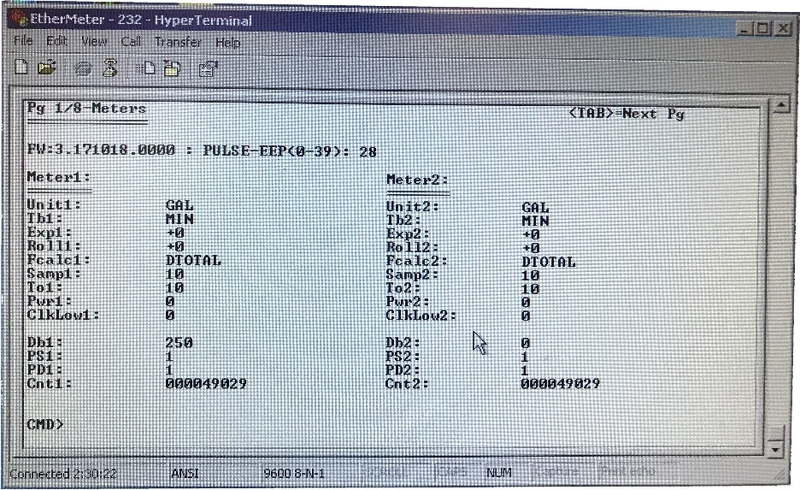 When interfacing with mechanical pulse meters, a common challenge is handling “Contact Bounce”. For example, after a certain volume of gas flows through a meter, the meter provides a single, brief contact closure. A contact closure event might have a duration of 50 milliseconds (typical), but it may also be shorter or longer in duration, as well. The contact closure could be in the form of a “solid-state” contact (a Transistor Switch), or it could be in the form of a “mechanical” contact (a Reed Relay Switch). When a mechanical Reed Relay switch closes, it may physically “bounce” during the make and break movements, which can be interpreted by sensitive instrumentation as multiple contact closures, instead of one, as intended. This can introduce significant over-counting errors into the monitoring system, unless properly handled through “De-Bouncing”. In this illustration, the raw, jittery pulse signal will likely be interpreted as 8 pulses. The digitally-debounced signal, however, will be correctly interpreted as 2 pulses. “De-Bouncing” describes the process of sensing the intended contact closure signal, while filtering out the extra, unintentional contact closures. De-Bouncing can be implemented in hardware, by using resistors and a capacitor to form a low-pass filter. De-Bouncing can also be implemented in the EtherMeter’s software, by using high-speed sampling and signal processing algorithms. Several years ago, SCADAmetrics introduced its first-generation, software-based De-Bounce Algorithm into the EtherMeter to provide an alternative to the resistor/capacitor hardware-based solution. Today, SCADAmetrics is pleased to introduce its second-generation, software-based De-Bounce Algorithm. The new algorithm analyzes incoming meter pulses against the user setting “DEBOUNCE_MS”, and accumulates the pulse count according to the logic described below. Illustration of How the EtherMeter Can De-Bounce a Jittery Pulse Input with a Software Algorithm. The Pulse Count will INCREMENT BY ONE. Pulse “Jitter” Simulation Rig. This Custom Device is Driven by an External Signal Generator Emitting a 1 Hz Square Wave. Output #1 is a Mechanical Contact Pulse Output. Output #2 is a Solid-State Contact Pulse Output. Used To Help Validate the SCADAmetrics EtherMeter’s Pulse Debounce Algorithm. Channel 1: Mechanical Pulse with Jitter, De-Bounce Algorithm Not Activated. Channel 2: Solid-State Pulse (Clean, No Jitter). Note that the Mechanical Pulse Count (977) Is Erroneously Higher Than the Reference Solid-State Pulse Count (419) by a factor of 133%. Channel 1: Mechanical Pulse Input with Jitter. De-Bounce Algorithm Activated with 250ms setting. Channel 2: Solid-State Pulse (Clean, No Jitter). Note that the Debounced Mechanical Pulse Count (49,029) Is Identical to the Reference Solid-State Pulse Count (49,029) — Thereby Validating the Effectiveness of the 2nd-Generation Digital De-Bounce Algorithm. The Second-Generation Digital De-Bounce Feature can be enabled by setting DB1 (for meter channel 1) or DB2 (for meter channel 2) to a non-zero value. (A setting of zero de-activates the De-Bounce feature.) Valid activated settings are between 1 and 500 milliseconds. DBn should be set to approximately 1/4 of the shortest time between pulse leading edges (in milliseconds). 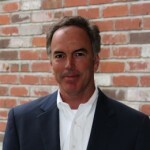 Please note that the maximum allowable DBn setting is 500 ms.
A thank you shout-out to Dennis Marsalek, MDM Global Services (Tucson, Arizona) for the many conversations and insightful advice that went into formulating this feature upgrade! All EtherMeter firmware dated 18 Oct 2017 and later will ship with the 2nd-Generation Digital De-Bounce feature. However, the feature will be de-activated, by default. Note: If you would like to upgrade an already-purchased EtherMeter, a firmware upgrade can be factory-flashed for a nominal fee plus shipping. Would the EtherMeter, with its Digital De-Bounced Pulse-Processing capabilities, better help integrate pulse-output flow meters into your SCADA, Telemetry, or Building Automation System? Give us a call! We’ll be glad to discuss the details!